When I tell people I have four kids, their jaws drop and they tell me I look like I am twenty-years-old. I thank them and tell them my real age, 32. Reality is, I am typically over-tired and fairly stressed. I have four kids, including twin toddlers, and I am self-employed. Enough said. But in the chaos, I make sure I take care of myself. It isn’t easy and days can go by where my hair is always pulled back and I am makeup-free, but I make sure I continue with a few beauty routines so that when the moment arises where I can get out for a little while, I am ready to shine. Take care of your skin. Okay, there may be many nights that I go to bed with my makeup on because I am too tired to remove it. But, in my opinion, what is more important than a skin-care regiment, is what you eat. I am an Omega 3 junky. I can honestly say that I see a direct correlation between my healthy skin and how much Omega 3 I consume. That means lots of fish, unsalted nuts and even brussels sprouts. I also try to avoid eating a lot of sugar. I still get breakouts, especially at certain times of the month. But if I go on a sugar binge, all hell breaks loose. Instead of laying out in the sun to get a sun-kissed look, I apply a high-end, non-streaking, self-tanner. 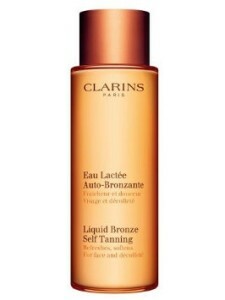 My favourite is Clarins Liquid Bronze Self Tanning lotion. (this post is not sponsored). It doesn’t streak, doesn’t turn me orange and never causes my skin to break out. This is on my Christmas wish list each year. Keep your teeth bright and remember to smile. I have been blessed with some pretty big chompers. If I don’t smile, my face just looks awkward. I have the most brutal passport photo as a result. When I am in a crowd, I make sure I do what is only natural, smile. Two of my biggest vices are red wine and coffee. In fact, I am pretty sure these are staples for most moms. If I didn’t regularly whiten my teeth, they would fall victim to my vices. 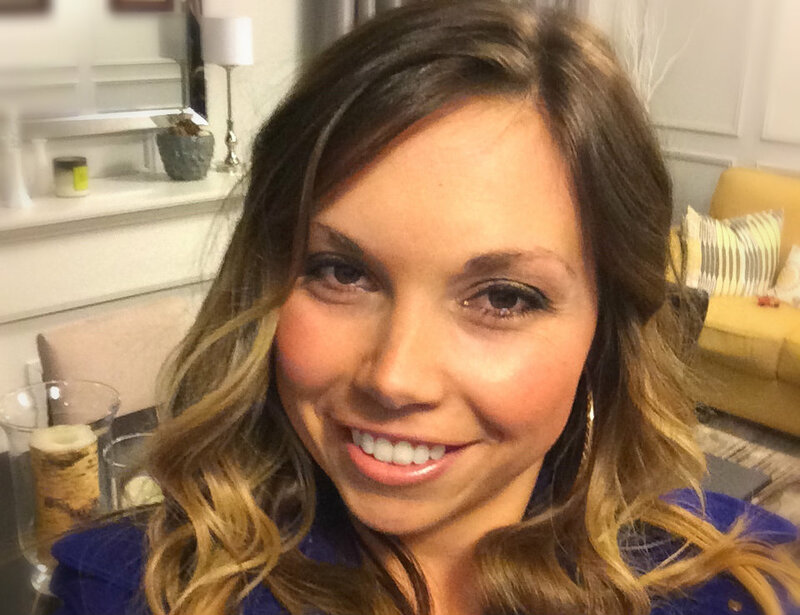 Talk to your dentist about teeth whitening options that could work for you. Don’t give up on your hair. I find a lot of new moms do one of two things: go for a low maintenance look by darkening their hair and chopping off their locks, OR (like I did) go for something drastic, that isn’t really you and ends up being a big fail. After having my son, I decided to go bleach blonde. It was an orange disaster. 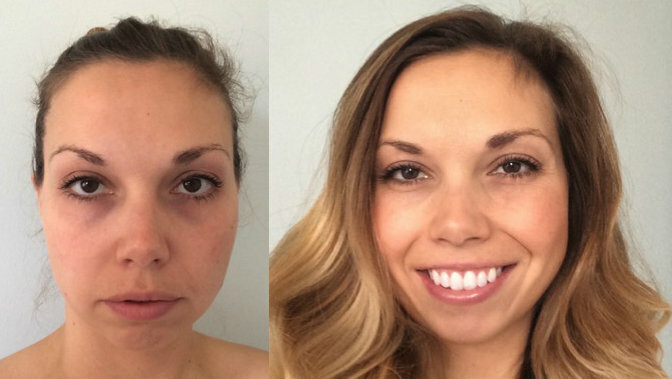 Don’t give yourself a drastic makeover. Find a style that suits you and is YOU! I found keeping my hair long with an ombre colour has been a perfect fit. It can be pulled up easily or styled showing off the colour. Don’t forget to follow Nesting Story on Facebook, Twitter, Instagram and Pinterest for wellness Wednesdays tips, Inspiration and my new body after babies updates! You are blowing my mind with your hair tutorial! I love how my hair looks when it’s been curled, but I’ve yet to master the technique! Next Next post: When Did I Become So Anti-Halloween?